Domestic budgerigars are familiar to everyone. Breeders have developed forms with a wide range of colours – green, blue, and yellow. Naturally they are a bird of the arid outback, light-green and yellow in colour, found normally in small flocks, but occasionally in extremely large flocks of tens of thousands. 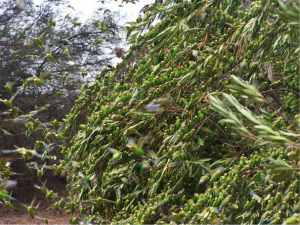 Enormous flock of budgies near Maralinga. Photo: Andrew Black. 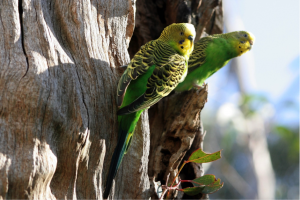 Budgerigars are primarily seed-eaters feeding on a variety of grass and chenopod seeds, depending in location and what is available. Normally they associate in flocks of a hundred or less moving across the ground as a group but each searching for seeds independently. Feeding occurs throughout the day with peak activity early and late in the day. In hot weather they need to drink and often do so as a group towards the middle of the day. Breeding usually occurs from August until January but good rains may extend the season or even result in a second season at another time. Pairs may have several broods in a season. Nests are often communal and placed in hollows in trees, tree stumps, fence posts or even fallen brances. The clutch varies from 4 to 6 eggs. Incubation is by the female who is fed by the male. 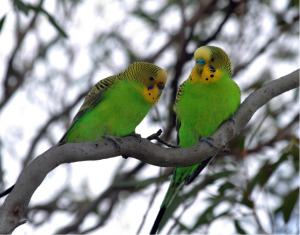 The Budgerigar, Melopsittacus undulatus (Shaw, 1805), is monotypic having no sub-species. A small, light green and yellow parrot. The forehead, front of face and throat are pale yellow with a row of round black dots at the border with the light green chest and belly. There is a small purple patch on the malar region. The back of the head, nape, mantle and wing coverts are also pale yellow but heavily marked with concentric black bars, narrowly on the head and neck, coarsely on the wings. The lower back and rump are light green, the tail is yellow with a dull blue centre and edges on the upper surface, and a dark grey centre and edges underneath. The flight feathers are a dusky green, darker above than below. A broken yellow wing bar is present on both upper and lower surfaces. The sexes are alike except that the male has a blue cere while that of the female is pinkish-brown when breeding, and pale blue when not. The bill varies from light grey-brown to yellow-brown, the iris is whitish, the orbital wing, legs and feet are blue-grey. Immatures are duller with smaller black spots on the throat and narrower barring. Buderigars inhabit a wide variety of open habitats such as open forest, savanna, lightly wooded grasslands, mallee, farmlands and plains. They can survive long periods without water but are rarely found far from water. They are nomadic and move according to the availability of water and seeding grass. At times the smaller flocks coalesce to form ‘super flocks’ of many thousands of birds (see Andrew Black’s photo from Maralinga). In south Australia they are common but irregular in the north-west, Flinders Ranges and north east. In the west they are moderately common and mainly seen in the spring and summer. They are rarely seen in the Mount Lofty Ranges and Kangaroo Island, usually in spring and summer.